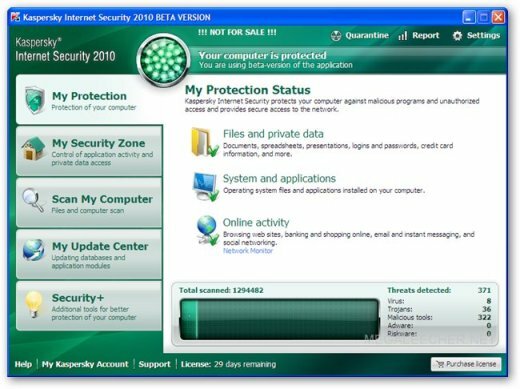 Anti-virus software need constant updating to protect users against new threats and this provides anti-virus software company's an edge for fighting piracy as they can check and block blacklisted keys whenever a pirated copy of software connects to internet for updating, leading security software vendor Kaspersky also blacklists pirated keys every few days making pirates go hunting for new non-blacklisted keys now and then, however, earlier pirates found a innovative trick to get past this limitation via a beta registry hack which allowed users to get genuine activation keys right from Kaspersky servers without any limitation bypassing the blacklisting completely letting them update Kaspersky Anti-Virus 2009 and Kaspersky Internet Security 2009 without buying, I was pretty sure that this hacktivation trick will get blocked in upcoming versions of Kaspersky products but to my surprise it still works in Kaspersky 2010 products. Note : Once again this is posted here for educational purpose only, the trick is same as earlier but a different registry entry - keep in mind, using this trick might be illegal, use at your own risk. Update : How to removed, Pls. read below. Please tell me i am wrong and this is not all about 1 month!! It really works great.. I've just turned my trial version into Beta version.. Back to Beta..
"Note : Once again this is posted here for educational purpose only, the trick is same as earlier but a different registry entry - keep in mind, using this trick might be illegal, use at your own risk." How can this help for education, kid? Everbody, ...just stop. The "Beta" trick is DEAD. That ship has sailed. Quit saying thank you, and how great the beta trick is. ITS DEAD. I can not believe that all the crackers of the world can crack things as difficult as Dongles associated with four and five thousand dollar programs, but nobody, to this day, can come up with a "VALID" hack for Kaspersky's Blacklisting. i want it 1 year, how can i do it? its not dead. you're supposed to click the red 'x' ( remove ) ur current beta license. THEN, you the beta license option will appear. i just re-licensed today. Kaspersky gives Incomplete virus definitions in Beta and Trial versions..
After some days, it'll blacklist, then google for this tym's latest keys and install this key after deleting previous key..
On google, u'll everyday find updated keys..
Did anyone try this trick with KIS or KAV 9.0.0.736? The Kaspersky trick is officially dead people. Whenever you delete your expired key and try activating new beta license (like you been doing all these months) it says the key is blocked. They've finally managed to block it. i was using my beta trick and it not working anymore, it is blocked!!! This has stopped working for me as of today!!!! I need Help!!!!! KIS NOT DOOMED YET...., BETA KEY BLOCKED!!! NO MORE BETA KEY PATCHING.., N' 30 DAYS HATCHING!! ALL GONE!! I GOT SCREWD Y'DAY NITE! Somebody has make a new post about this asap! version" is not work now .now kis is showing a error msg. the msg is " key file is blocked ......." plz give info about any trick to re active. I am using beta trick bt now its not working. Can this hack use for Kaspersky PURE, the new software from Kaspersky. It is much powerful than its Anti-Virus and Internet Security version. I am very interested to use the password manager so that i don't have to remember all my email, social network passwords. I know kaspersky blocked keys after few days but you can escape it if you update your key in some days . I do this and my kaspersky 2011 working well. I download kis keys from here --ADMIN EDIT-- don't share this site to everyone because chance of getting blacklist key will increase.